Want to make me buy a book? Put a dinosaur, a robot, a monkey or an ape on the cover, or have Jae Lee draw the cover. It's that easy. Well, that, and I have a thing for Number 1's, or first issues. 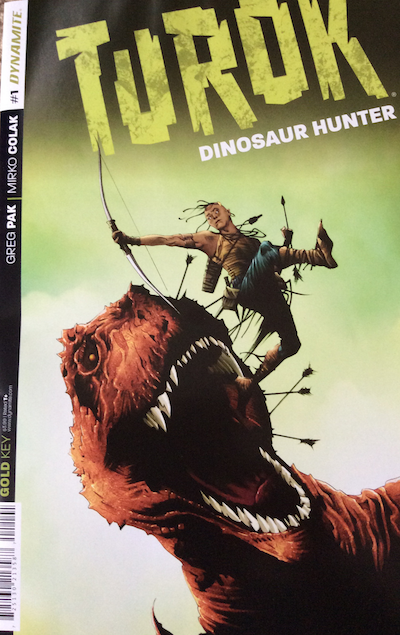 Turok: Dinosaur Hunter is one of the comics in Dynamite Comics' reboot of the Gold Key Universe. The first issue certainly sets up an intriguing world where Turok faces bullies, dinosaurs, and something much worse. The art, including lines and colors, is appealing. I'm looking forward to the second issue. Needless to say, Greg Pak writes a good story.